I am working a pattern using only Knit and Pearl stitches. I'm about three quarters near the end and discovered an error I made about one-quarter of the way from the beginning. Can I finish the item (Baby Blanket) and bind off, then tear out from the beginning and work down. I really don't want to tear out all the work that is good. Have also used this method to lengthen or shorten an item. In this instance how about doing something much easier? After the blanket has been blocked, embroider a motif over the error and also a few scattered over the blanket. I have done this even I'd there is not an error and it adds a special touch, too. YOU have a couple of choices, none of which will be pleasant or easy to do. Depending on what the stitch pattern is and how noticeable the error is, you could just leave it as it. I know that this option will probably rub the wrong way, and I would feel the same way, but honestly nine times out of ten you will be the only one who notices the error. Most people will not even see it and will still be amazed at your skill as a knitter. Another option is the one you have asked about. I have done this to fix errors or the lengthen a piece of knitting. Basically what you need to do is to take out a row bu cutting the yarn and pulling out the thread stitch by stitch. Then you pick up the loops/stitches and start knitting downwards. If I was you I would unravel a row just above the error and reknit the bottom third rather than unpicking the cast on edge and trying to unpick multiple rows. I have never been that successful at attempting that and I end up with a lot of short unusable lengths of wool. If you unravel a row above the error you can then unpick the bottom third that you have detached the normal way. The third option is the one I would probably go for. You just unravel the stitch or stitches above the error all the way down the blanket and then redoing them the right way with a crochet hook. You do this before you bind off. I am knitting a baby blanket. I am 3/4's of the way finished and I noticed that I made a mistake in the border, four lines from the cast on row. The border in garter stitch and in the middle of the fourth row, for about 10 stitches I accidentally did the stockinette stitch. Since I don't want to rip out almost an entire blanket, I was wondering if I could rip out from the beginning of the blanket, where I cast on, which is only four rows away from the error. I feel your pain. It can be so frustrating when you notice an error like this one, and I assume that as it is 10 stitches, the error is quite noticeable to you. But before you start ripping the border out, ask someone else (preferably someone reasonably impartial) to have a look and see if they notice it without any prompting. I find that most knitters (myself included) are fairly critical about their own work, and once they find something they have created is less than perfect, they can never be happy with the finished product if they don't attempt to fix it. 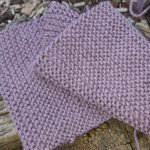 So, who is the baby blanket for, and does a small error (and it is a small error when you consider how much time and love goes into knitting a baby blanket) completely ruin the finished product, or are you being too hard on yourself? Instead of unpicking the border and re-knitting could you leave it as is? Ask yourself whether a new mother would notice or even care about it. It does after all make this particular blanket unique! Maybe you could add a ribbon/bow at the point as decoration (and hide the flaw)? Having said that, if it was my baby blanket, I would have sworn a couple of times and I would have already unpicked it by now. One of my helpful visitors has provided a great explanation of how to do just that while answering an other question in this section of the website. You will find it in the comment section of this page.